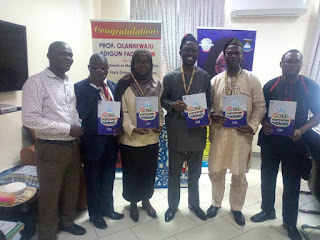 Lagos State University International School (LASUIS) Unveils / Launches Annual Report Year Book Under the Leadership of Prof. Olanrewaju Fagbohun. One of the hallmarks of the Olanrewaju Fagbohun-led administration is the introduction of an Annual Report for the University, as one of the means of being accountable. Following in that wonderful footstep is the Board of Lagos State University International School (LASUIS) under the distinguished leadership of Prof Rafiu Okuneye. The Board has, in an unprecedented feat, introduced the LASU International School YearBook. It is a compendium that captures the activities and achievements of the School in the last one year. Prof Okuneye and other members of the Board were at the Office of the Vice Chancellor, Prof Olanrewaju Fagbohun, on Wednesday 19th of September, 2018 to present him the Yearbook of the School. The VC in receiving them expressed his deep satisfaction and appreciation to the Board for the initiative calling on other components of the University to copy the wonderful act.